-----The Gulf coast is notoriously shallow. Locals say you gain one foot of water for every mile you travel offshore -- and that does not account for the bars and shoals! Any skipper of these waters who claims never to have gone aground is either a liar or has never left harbor. -----The Waterway is dredged to a 10-foot depth, but with floods and tidal currents the sands are always shifting. A moment of inattention, or a shift of the marks, can run a skipper aground. There is little leeway when heavily-laden barges pass, especially in the night. -----Last night, the river won a round. 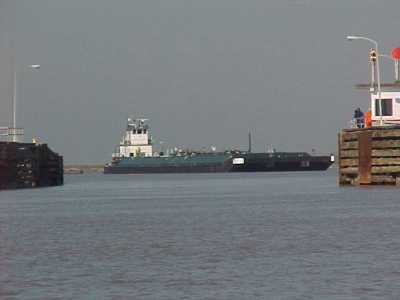 An eastbound tow, pushing two barges laden deep with fuel oil, tried to cross the Brazos. The captain made it through the west floodgate, but, in the river, the force of the floodwater gripped the tow and two loads. The bow of the string of barges swung downstream. All the power of those massive diesels, one full ahead, and one full astern, tried to spin the bow up against the brown, churning current. The river won, and the lead barge plowed into the heavy mud of the opposite shore. The skipper pressed both engines into reverse -- too late. The current shoved the whole string against the shallows and all the power of those engines could not prevail. They were hard aground. The Waterway was blocked. -----The Gulf Intracoastal Waterway, between Corpus Christi and Galveston, is one of the most heavily used commercial waterways in America. It is a marine highway, and the tows, with their attendant barges are the 18-wheelers of the road. -----Last night, with the highway closed, tows backed up for miles on each side of the Brazos. All this happened while we peacefully slept at anchor in a cove a few miles westerly. -----When we started out in the dawn light, the VHF radio was crackling on Channel 13. We listened transfixed. -----"Still on the hard, Cap?" -----"The mud's got us, Pete." -----"Hold on. I got my loads tied off so we'll clear them and come on down and help shove you outa there." -----"OK, Pete. We could use a little push on that head load." 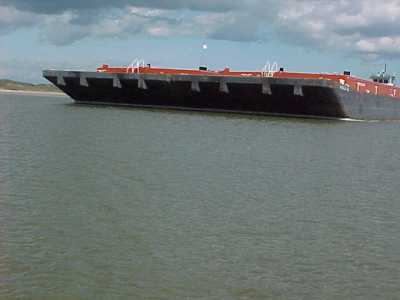 -----There was quiet for a while, except for the reports of newly arriving tows reporting to the floodgate operator about their arrival in the queue. She was the traffic officer through the gates. We called in also and slid in behind "Walter S." Soon, as the "Joan Lafitte," came up behind us, we were a little white chip between the long black barges -- the sugar in the Oreo. -----"411? We're the light boat coming to the west gate." -----"Go ahead, skipper," said the operator as she cleared Pete through the gate and into the river to help free the stranded barges. -----For the next half hour we listened as the two captains exchanged ideas and movements on their radios. Like a choreographed ballet, they sashayed and shimmied -- and then the barges pulled free of the sucking mud. With two towboats, the string was easily maneuvered through the east gate. -----"Have a good trip, Cap." -----Tow skippers are a laconic breed. -----The Waterway was now open, and the gate operator gave the orders to the waiting tows. We followed "Walter S." through, marveling at the skill of her skipper as he swung tons of steel and fuel oil through the narrow slots. 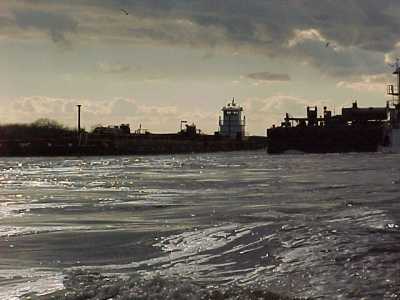 -----On our way easterly, clear of the Brazos, El radioed "Walter S." She asked the captain if it was O.K. to make a two whistle pass. She complimented him on his skill with his tow. -----"Come on by, ma'am. And thanks for your words - it's all in a days work."